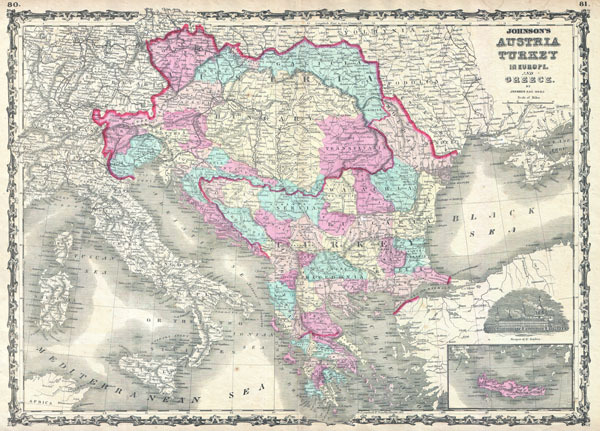 This is A. J. Johnson and Ward's 1863 map of Austria, Turkey in Europe and Greece. Covers from Italy eastward to include all of Austria, Hungary, the Balkans (Bosnia, Serbia, Albania, Croatia, Macedonia, Bulgaria, Rumania, etc. ), Greece and parts of Turkey. Color coded by district. Shows major roadways, cities, rivers, trains and ferry crossings. Lower right quadrant offers a view of the Mosque of St. Sophia in Istanbul. Features the strapwork border common to Johnson's atlas work from 1860 to 1863. Steel plate engraving prepared by A. J. Johnson for publication as page nos. 85-86 in the 1863 edition of his New Illustrated Atlas… This is the first edition of the Johnson's Atlas to bear the Johnson and Ward imprint. Very good condition. Minor verso repair and reinforcement along original centerfold. Blank on verso. Rumsey 2905.048 (1860 edition). Phillips (Atlases) 6140.